Caleb Scharf’s latest book investigates the tension between the Copernican Principle (that there’s nothing particularly special about us or our planet) and what he insists on calling the Anthropic Principle but would be better described as the Rare Earth Hypothesis (that Earth-like levels of habitability are very rare or, perhaps, even unique). I’ll come back to why I object to it being called the Anthropic Principle later but that really is my only complaint with this excellent book. The book begins with a fairly conventional tour of the historical background to Copernicanism but with the nice twist of bringing in Anthony van Leeuwenhoek. Van Leeuwenhoek’s 17th century discoveries of new microscopic worlds occurred at a time when our cosmic horizons, too, were being expanded in ways that were unimaginable to earlier generations. After this introduction, the book covers important developments in both astronomy and biology to paint a picture of a Universe in which our kind of biology (i.e. carbon and water based) is the obvious way for life to develop but also a Universe in which the orbital stability of potentially habitable worlds is far from guaranteed. Throughout the book, therefore, Scharf attempts to find a middle way between a life-everywhere and a life-almost-nowhere view of our cosmos. 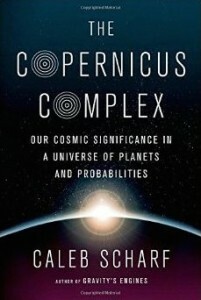 Towards the book’s end, the author suggests that this happy-medium naturally arises from a new “Principle”; the principle that life develops on planets and in a Universe that are on the edge of chaos; places and times where there is enough going on to be interesting but not so much that everything becomes completely random and unpredictable. This fascinating idea is beautifully explained but, in my view, it needs much more hard evidence before it can really be raised to the level of a “Principle”. At present it is just an interesting hypothesis. That brings me to my only issue with this book; Scarf’s treatment of the Anthropic Principle (and this time it is a genuine principle!). I’m a big fan of the Anthropic Principle, having written several papers and a book on the topic, and my problem here is that it is definitely NOT synonymous with the Rare Earth Hypothesis. I’m rather surprised that Scarf treats these as synonyms since he passionately describes the importance of Bayesian statistics in The Copernicus Complex and I would say that the Anthropic Principle is a direct consequence of Bayes Theorem. Bayes Theorem tells us that the typical properties of inhabited planets will be intermediate between the most common values found in the Universe and the values that are most suitable for life. That is why it is sometimes called “anthropic selection”; inhabited worlds have biased properties compared to the general population of planets. Like Darwinian evolution, this bias is mathematically unavoidable but its size is not currently known for any interesting properties. It might be large or it might be small. Hence, the Anthropic Principle does not necessarily imply that habitable planets are rare. To be fair Scarf makes this point too, in his own way, but I think he should have drawn the obvious conclusion and stopped using the Anthropic Principle as an antonym to the Copernican Principle. But this is just a very minor gripe. Read the book; it’s fascinating, authoritative and beautifully written.